In the 70’s when drug traffickers found the US market for cocaine saturated, they targeted Europe, through a string of weakly- governed, unstable and smaller countries in Africa. AQIM (a branch of Al- Qaeda) terrorized Northern Mali and almost took over the entire country in 2012. Sustaining their activities through kidnapping and ransom of Westerners, the Islamists earned between $40m to $65m from tourists in Mali and Niger. 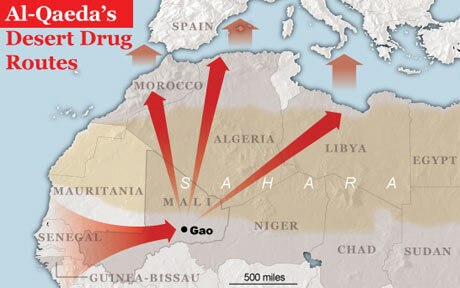 When tourists no longer came, escorting cocaine convoys across the Sahara became the answer. By then, the lucrative business had lured local soldiers, diplomats and even a couple of heads of state into cooperation. When Muammar Gaddafi fell in 2011, tens of thousands of his men fled south with trucks full of cash and arsenal, including armoured vehicles, surface to air missiles, grenade launchers and thousands of AK-47s. AQIM was able to buy this arsenal using the money they had earned through cocaine smuggling and ransoms. With it, they expelled the local forces and temporarily created a terrorist state in northern Mali. Mali, a favourite destination for Western aid in Africa, was most recently pledged $4b, the irony still lost on its donors. Whilst Mali’s soldiers train with US counter-terrorism experts, and the government receives aid, it continues to do business with an Al-Qaeda group that kidnapped Westerners and smuggled billions of dollars of cocaine into Europe. Using this crime money they had created a terrorist state an hour’s flight from Europe, until France intervened with force.